The term cerebral palsy is not one that most of us are familiar with unless we have a loved one or have interacted with an individual with cerebral palsy. At Rebound Hawaii, we want to educate family and friends about the diagnosis so that we can do our part to inform our community in addition to providing treatment. Cerebral palsy is a diagnosis that is caused by brain injury during fetal development, birth, or after birth before the age of three years old. This diagnosis manifests as a movement disorder, causing significantly delayed early milestones such as an inability to roll, sit, crawl, or walk independently– even well past the expected age. The brain injury causes involuntary or decreased control of muscle movement. It also leads to abnormal muscle tone where the muscle feels like it is constantly tight or inactive. Depending on the site and severity of injury, vision and cognition may be affected. 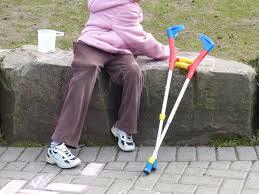 Typically, cerebral palsy is determined within the first few years of life. Your baby’s pediatrician may notice abnormal muscle tone and/or developmental delay during wellness visits. The pediatrician may want to monitor your baby’s development over a period of time before referring to a neurologist. Imaging is needed to confirm the diagnosis and to clarify the type of brain injury. If you suspect that your child is not meeting developmental milestones on time, don’t be alarmed, as developmental delay does occur in children without cerebral palsy. Rather, communicate your observations with the pediatrician so you may have all your concerns addressed. For more information on when your baby should meet her gross motor milestones, please see our blog post on Developmental Milestones. Treatment involves a medical care team consisting of doctors and therapists. There are varying levels of functioning dependent on the severity of the brain injury. A child with cerebral palsy will likely need some form of orthotics to correct foot posture and improve walking pattern. There is adaptive equipment that help children who have cerebral palsy walk and negotiate their environment so that they can maximize their experiences and functional mobility. A doctor’s primary role is to follow the care of the child, provide various surgical procedures, administer medication to improve tone, and refer to therapy and other specialists. At Rebound Hawaii, physical therapy treatment would focus on improving balance, range of motion, strength, and functional mobility. We help individuals with cerebral palsy acquire orthotics and adaptive equipment. Cerebral palsy is not typically a progressive diagnosis, meaning that it does not rapidly worsen over time. However, it does impair development and functional mobility. Therefore, the right medical and therapeutic treatments are needed to optimize quality of life.